Major E.M. Hamilton was a New York inventor. 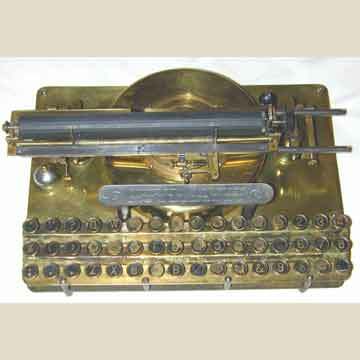 In 1888 he built one of the gems in typewriter history, the Automatic typewriter. It is not quite clear what the meaning of the word 'automatic' was with regard to this machine, although it was equiped with a unique feature: proportionate spacing. The Automatic breathes the athmosphere of the jeweller's workshop, possibly through Hamiltonâ€™s cooperation with Henry Abbott, who was a jeweller. The machine is built with miniaturized parts, like tiny type bars that perform intricate acrobatics to perform an inverted grasshopper motion between their ink pad and the paper. The case and keytops of the machine are made of brass, giving the machine a spectacular appearance. The Hamilton factory was active for two years only and production was ceased in 1891, About ten of these spectacular machines survive.